Feed your M-14, FAL, Remington 700, AR-10, or other 7.62 NATO (or .308 Winchester) rifle some real mil spec ammunition with this case of 7.62x51mm ammo from the Lake City Army Ammunition Plant (LCAAP). LCAAP is operated under contract by Federal, a division of the Vista Outdoor group, and supplies the US military with most of its ammo needs. Lake City ammo is highly sought after due to its military origins and highly consistent performance--and as government surplus, it's relatively affordable to boot! Each Boxer primed cartridge in this case of 500 fires a 149 grain full metal jacket bullet at a muzzle velocity of 2,790 feet per second. These rounds follow the M80 specification and can be used interchangeably with other 7.62 NATO ammo loded to this standard. Lake City ammunition is produced in Independence, Missouri using non corrosive Boxer primers and reloadable brass cases. Like all mil spec ammo, the cases have visible annealing marks for easy visual confirmation that they have been treated correctly for strength. Pick up this case or any other items totaling $99 or more at AmmoMan.com to get free shipping! Can't say enough good about this ammunition! 500 rounds without a hiccup! AMMOMAN is the best! I'm ordering more of this ammunition! 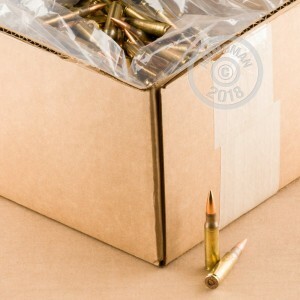 Good ammo, and great service from AMMOMAN!! Ordered 500 rounds a month ago...good for 1 to 1.5 MOA. Ringing steel and practice...can't go wrong. Lucky Gunner is my NO. 1 "go-to" for quick and affordable range ammo. Don't hesitate to buy this lot. Ordering my next 500 tonight. Not match grade ammo but out to 500 meters it produced 4 inch groups out of my dpms recon with a 1x8 vortex viper scope. I'm very pleased with this ammo. Will buy more to stock pile and shoot regularly! Just now ran about 400 rounds through 2 new Aero Precision AR's and 1 new DPMS AR. Rifles ran flawlessly with this ammo, actions stayed pretty clean, and consistently hit clay targets (stationary) offhand at 100 paces distance. I don't intend to go hunting, or to a target match, with this this ammo. What I DO intend to do is shoot my rifle often enough to get good with the gun, and this ammo will allow me to do that without going broke on ammo cost or worrying about ammo quality problems. So, it's not "beautiful" ammo -- it's great for shooting, but not pretty enough for making necklaces and keychains out of. It's military surplus ammo, made in the USA, so I figure if it's good enough for our soldiers worldwide, it's plenty good for me. It has crimped in primers, annealed case necks, and cannelured bullets that are crimped in the groove. I can see NO evidence that these are "battle field pickups" (whatever THAT is...I'm not the Expert) or 3d time reloads, like extractor marks on the case rim or bulged case heads, for example. The cases are not Dirty, just not mirror-polished and somewhat dark. They are definitely not corroded, I'm 100% happy with this ammo. I'll buy more, shoot a lot of it, and store some. Have fun shooting and be safe. Worked great, no complaints, will order from again! It's great ammo and my M1A NM will spit it out just as fast as I can think about it. I was consistently getting 2.75" - 3" groups with a 20 - 35 MPH gusting crosswind @ 200 YDS. (YAY West Texas!) and 1 to 1.5" with light winds at the same range. It might be a little dirty but I can spend an hour cleaning it up. Besides, you should be inspecting each round anyway. It performs better than the bright and shiny PMC that comes packed in 20 RD boxes with the plastic dividers. Out of the 2 boxes that AMMOMAN has been kind enough to share with me I've had no issues with it in my rifle and have only rejected one from each box of 500. One was dented and the other had the round canted about 5 degrees off center. I thought them to be a worthy sacrifice to my ammo gods. I will be ordering more and have told several people at my local range about AMMOMAN.COM. Keep up the great work! Ammo looks fine but was shipped in just a cardboard box, not even a plastic bag inside... will try some out ...probably fine. If you want pretty ammo this ain't it. Little tarnished, but I didn't buy it to enter it in a beauty contest. It works fine in my M1A and shoots decent groups at a good price. Exactly what I was looking for. Do not hesite to purchase this 7.62x51 ammo. I am shooting a psa ar10. Took this 2017 LC NATO 7.62 x 51 ammo to the range today. Firing 3 shots every 6 seconds using a grip-pod with stock unsupported from a bench at 100 yards my Ruger SR-762 consistently shot 1 1/8" to 1 1/2" groups for me and 2.0" groups for my wife. This is excellent ammo and very accurate. I'm sure we could have cut the groups in half had we taken our time and used sandbags front & back, but it was in the 90's and we were too tired to try. So the brass had a slight tarnish. Awesome run of 150 rounds through my M1A with no problems. Great range ammo. I am no expert but I had better results with this Lake City than my last run of Hirtenberger. This will be my next resupply, hope the price holds. Fast shipping, double boxed, good looking ammo, slightly tarnished cases, much better condition than some reviewers claimed. I'd rate the visual condition at +95%. Haven't shot it yet due to the range being flooded. This ammo was better then I expected. It did well at the range, and I had no failures. Thank you Ammoman. Reasonably accurate and goes bang every time. Looks like typical like city ammo. No complaints here. 500 rounds of loose ammo- clean brass and reloadable. What more could you ask? Ammo may have been a little tarnished and with a waxy residue, but cleaned up real nice with little effort. Fresh ammo dated LC 2017, Shoots great at avg 2800+ FPS. Not match or sniper ammo, but you can’t load any kind of practice ammo this cheap. I ordered on Monday and my ammo arrived on Tues afternoon. I don't know why people complain about the looks of this ammo. It may have had a slightly dirty look, but to me, it looked very clean and serviceable. I haven't had one round misfire. Great ammo. A little dirty but if you want shiny it’s another $100-$200. This is very shootable ammo delivered fast for an ok price. Just received this shipment Fedex. Packaging was not in good shape. Tape was broke through on one side, corners looked like they had been droped multiple times. Upon opening, the cartridges appear to have been battle field pick ups. Tarnished very bad, almost looks like 3rd time reloads with no cleaning of brass case. Have not fired any, yet. The bullets appear bright and shiny. only the brass casing looks terrible.